Bring light snacks or PB&J with you into the parks. You may bring a small lunch box with you. Water is essential as well. Focus on items that won’t spoil in the heat. Eat breakfast in your room. You’ll pay out the nose for a breakfast buffet, so instead stock up on Pop Tarts, granola bars, bananas or muffins. Alternatively, eat breakfast off-site at Denny’s, Perkins or McDonalds. However, this only works if you have a car. Split a meal. Most portions are large enough to accommodate. Share a large soda as well. Adults may order off the kid’s menu at most quick-service restaurants. It’s a smaller portion size and a better value too. If you need a soda fix, head over to Club Cool at Epcot. You’ll be able to taste test different sodas from across the world, for free (well included in your admission..). You’ll receive a shot-glass sized paper cup, and can refill as much as your heart desires. Do you have great tips to save on dining at Disney? Let us know in the comments! 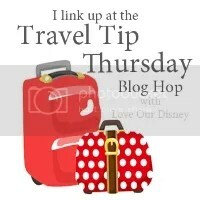 Thank you for linking up on Travel Tip Thursday. This post was featured this week! Hope you will link up again.